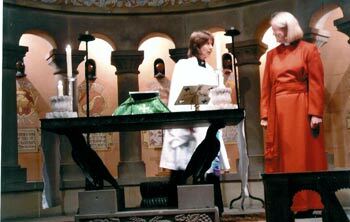 The Rev Heather Carter (née Robson) priested in Carlisle Cathedral by Bishop Graham Dow. 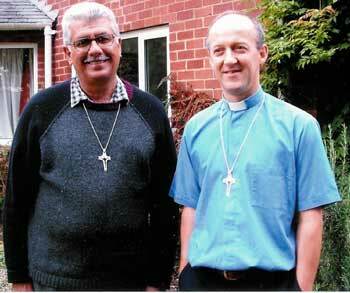 Bishop Graham was joined in the laying on of hands by Bishop Miguel Tarrago who had ordained Heather deacon in Uruguay. Heather was also supported by Preb. Gill Behenna of Exeter Cathedral, her mentor during her years of work signing for deaf people in South America. 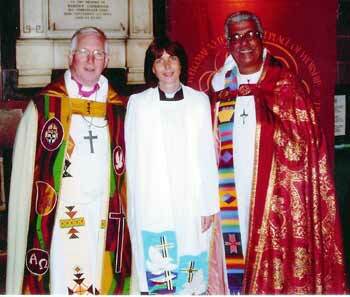 Heather's beautifully embroidered stole was by Wrington artist, Monica Duthie - her first foray into liturgical dress decoration. 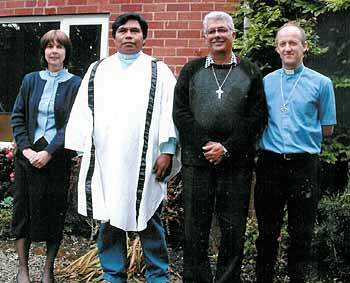 With Heather and Bishop Miguel are the Rev Crisanto Rojoe from Argentina and Heather's husband, the Rev Stephen Carter. Further details in Roy's message on the Schmoose page.